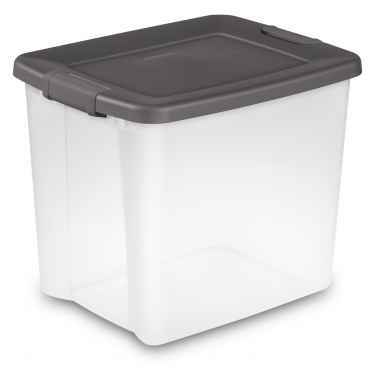 These Sterilite 50 quart shelf totes have a clear base with an attractive gray lid. The clear base enables you to quickly and easily see the contents of the 50 quart latch tote and the gray lid ties this tote in with the rest of the items from this storage collection from Sterilite. The latches on these 12 gallon storage bins securely lock the lid onto the base to ensure that none of your storage items will be lost or damaged during transport or storage. These wonderful storage totes by Sterilite are also stackable to provide the most space savings.